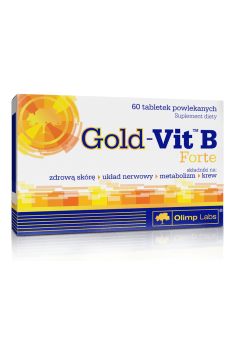 Gold-Vit B Forte 60 tab. 1 tablet a day or otherwise after consulting a doctor. The supplement contains quite high doses of B vitamins. Because of that, it is recommended to follow the manufacturer’s recommendations and take one tablet daily. It is suggested to take vitamins from this group in the first half of the day – when they are taken in the late evening, they may cause insomnia in some individuals. B vitamins are water-soluble, but it is not recommended to take them on an empty stomach. Food reduces the risk of the so-called niacin flush. It is manifested in skin redness and a tingling, burning sensation. This condition is not harmful to health and disappears after several minutes, but it is quite unpleasant. The complex of specially selected bovine tissues, free from pesticides, growth hormones and antibiotics. Natural precursor of steroid hormones. It supports maintaining hormonal homeostasis. The source of pregnenolone, a compound capable of optimizing functions of the endocrine system. Stimulates metabolism; increases thermogenesis; stabilises blood sugar levels. An advanced formula that comprehensively supports the functioning and health of the liver and gallbladder.